Now that this blogger (and formally trained reporter) has finally stopped gushing over these photos, I can tell you what they’re all about. 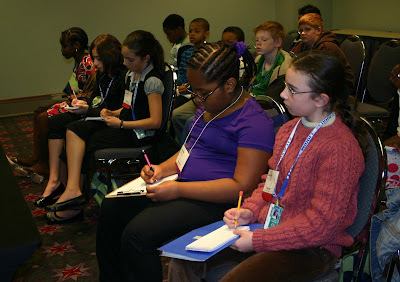 Today, about a dozen sixth-graders from Stewart Middle School in Norristown, Pa., visited the APHA Annual Meeting in Philly to do a little reporting for their school newspaper, the Stewart Healthy Times. Student reporters grilled public health researchers on everything from tobacco to H1N1 flu to how to prevent getting sick in the first place. 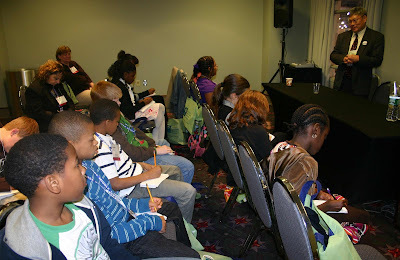 To learn more about Healthy Times, a school-based newspaper program that engages students in promoting health, fitness, nutrition and safety, visit the Food Trust, or stop by session 5084 on Wednesday morning from 8:30 a.m. to 10 a.m. in Marriott 413 to hear more about the Healthy Times program. 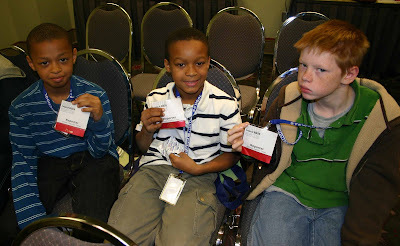 Above at top and middle: Young reporters from Stewart Middle School show off their press badges and take notes during a news conference. Bottom: Past APHA President Walter Tsou takes questions from the young reporters.